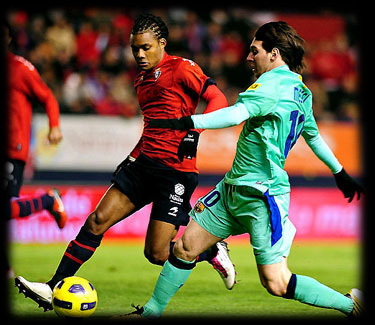 28.01.2011 » Nélson: "Cristiano Ronaldo is one of the best players in the world"
Osasuna's portuguese defender, Nélson, assumed he isn't afraid of playing against Cristiano Ronaldo this weekend, even though he admits that CR7 is the most important player in Real Madrid. Nélson, one of Osasuna's defenders, will play against Real Madrid this weekend but he assumed he's not afraid of his task. The portuguese defender will have to face Cristiano Ronaldo and he says he's not worried about that. He reminds that he already played against Barcelona and Lionel Messi and the outcome wasn't that bad at all. Nélson: "It hasn't disturbed my sleep knowing that I'll play against Real Madrid and Cristiano Ronaldo. It's a great team, one of the best in the world, with an amazing coach and tremendous players. It's a fact that Cristiano Ronaldo is one of the best in the world, but I've already played against Lionel Messi this season and I'm still alive! However, Nélson reckonized that he will have a lot of problems to solve during the match. "Cristiano Ronaldo is the most important player from Real Madrid and it's pointless to argue against that, by saying that football is a team sports, because there are always individual players who can make the difference in such teams." The former Benfica's defender, confessed an interesting wish. "It would certainly be an easier match if I could play in the same team as Cristiano Ronaldo. Hopefully that will happen someday. May that be in a club or in the Portuguese National Team." Apart from the Ronaldo topic, Nélson also talked about José Mourinho, who he considers an "incredible coach". Nélson said: "José Mourinho has been a bit persecuted here in Spain, because he's controversial and direct person. But the biggest reason is probably because he keeps winning matches. I can only imagine how good it would be to have the opportunity to be coached by him. Most of the people here in Spain didn't appreciate the fact that he won the "FIFA Best Coach of the World" award, but the evidences are so clear that I truly believe he won fairly. Obviously, I would want to be coached by him someday and I honestly believe, that if that had happened before in my career, than I would have turned into a better player. Real Madrid and Cristiano Ronaldo will play against Osasuna next Sunday. You can follow this match through livescore and livestreams here on www.ronaldo7.net. Countdown for the match is on the top right corner of the website.